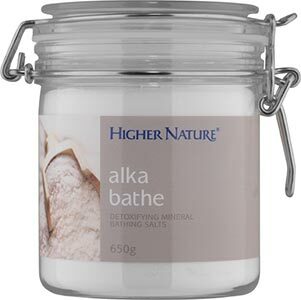 Alka-Bathe provides alkalising minerals for a complete detox. Cleansing and detoxifying the skin by drawing out acid waste products, it is also relaxing and soothing - comparable to a hot spring spa. Only two tablespoons are needed per bath. 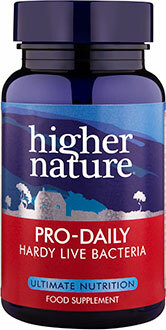 For a full detox programme use in conjunction with Alka-Clear capsules or powder. The 650g clip-top Kilner jar will look great in your bathroom and comes with a scoop. Potassium bicarbonate, sodium bicarbonate, silicon dioxide. Sprinkle approximately two tablespoons of Alka-Bathe under the taps as you fill the bath. Re-cap immediately. Soak for at least 15 minutes, gently rubbing your body with a washcloth or loofah to facilitate the cleansing action. Preferably, do not wash your hair when using Alka-Bathe. After bathing, dry off and rest for 5-10 minutes. Preferably, do not wash your hair when using Alka-Bathe.